THE TOT IT UP CHALLENGE. The Tot It Up Challenge is a new initiative that started yesterday (7th November) to encourage parents to take a closer look at their children's eating and nutrition habits. Organised by the Infant & Toddler Forum, the initiative has been set up to encourage at least 1000 parents to sign up and make a food diary of their child's food and drink consumption over a period of time. There is also an app available to make entering your child's meals and snacks a doddle, on the go. Why should I sign up? I hear you ask. Well, I was contacted by the ITF and asked to take part and share my thoughts with you. We have been inputting Harry and Matthew's food and drink intake, using the online tracker for the last 7 days and a snapshot of our findings are below. The screenshots show details for Harry, but you can enter details for each of your children separately, so long as they are aged between 1 - 4. 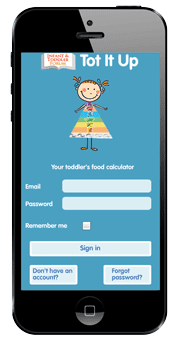 Each day, either throughout the day, or all at once, you enter your child's food and drink intake using a really easy to use input tool. You also need to put in your child's activity levels too. I will be honest with you here, my two are in childcare all day, Monday to Friday, so it was difficult for me to accurately put their true timings in for this part, so I just estimated. At the end of the day, you get a summary of the day's activity. For me this was so useful as a parent, because I worry about portion size and whether they have the right balance from each food group. You get to see a recommended bar and an actual bar underneath for each food type, so it is really easy to see whether your child is meeting the daily recommended amounts for their age. I was surprised to see that Harry's confectionary intake was very high though, as he only had one chocolate Rocky bar after his tea. But this is maybe an area to keep an eye on in the future. I was pleased that he was meeting the recommendations in every other area apart from dairy. On this day he didn't have his usual yoghurt or cheese, so I'm not too worried, because I know that he usually does. I also didn't manage to put his drinks in accurately, on this day. I did try a couple of times, but it still just showed the 1 cup in the summary. For me, the most useful part of this tool, is the ability to tell yourself that you are doing a good job. It's really easy when you have a busy lifestyle, to beat yourself up that you aren't getting it right. This quick calculator puts the mind at ease. The Tot It Up challenge runs from the 7th of November until the 21st of November 2016. If you register on the forum and input at least one day's food intake, you can be in with a chance of winning one of ten £50.00 shopping vouchers. If you would like to know more about your young child's portion sizes, the ITF have put together this infographic containing some really interesting facts. I hope you will sign up and start to benefit, just as I have done, from this really useful tool.